Welcome back to my blog! Today I want to share the rest of the Valentine's cards and some more details on how to make the bag to hold the cards. The card base is made from Pink Pirouette Card Stock. I splattered the background with an aqua painter and some Pink Pirouette ink from the refill. Next I cut an arrow shape from one of the patterns from the More Amore Designer Series Paper, and stitched around the outside edge with my sewing machine. I diecut and embossed two hearts from the Real Red Core'dinations Card Stock using the Scalloped Heart of Hearts Embosslits Die. I then sanded the top of one heart and the bottom of the other. I adhered the arrow and the upside down heart first, and then the second heart with Stampin' Dimensionals, adding a small bow from Pool Party Baker's Twine and the Tombow Multi-Purpose Adhesive glue. Here is a close-up of the card. To finish it off, I used the Itty Bitty Banners die to cut a banner from the same small hearts Designer Seriers Paper print, and also cut a "2" from the Real Red Core'dinations Card Stock, sanding the edges. I adhered them to the lower right of the card, and stamped "gether" underneath the "2" with Real Red Classic Ink and the Simply Serif Mini Alphabet Wood-Mount set. Then, I pronounced the card done! And, for my last card, I started with Pink Pirouette card stock for my card base again. I die cut a heart using the Heart Collection Framelits Dies and some scrap paper. I temporarily adhered it to the card front, sponged Pool Party Classic Ink around the edges, and also splattered some more Pink Pirouette Classic Ink on the card using an Aqua Painter. For the focal point, I stamped the striped banner image from the Hearts a Flutter Stamp Set using both Pool Party and Pink Pirouette inks onto the new Canvas Creations sheet. Then, I trimmed around the images with scissors. I folded these over two of the hangers from the Hung Up Cute Clips and wrapped Pool Party Baker's Twine and ribbon from the Artisan Embellishments Kit around the top of the banner. I mounted them to the card front using Stampin' Dimensionals. For the hearts, I colored the solid heart stamp image from Hearts a Flutter with a Real Red Watercolor Crayon, wet it with an Aqua Painter, and then stamped it onto Whisper White Card Stock, twice. I then stamped his and hers using the Simply Serif Mini Alphabet and Basic Grey Classic Ink. For the rest of the greeting, I printed it onto Vellum Card Stock, and attached it to the card front with Silver Mini Brads. Here is another close-up of the card. Love the canvas Canvas Creations. Can't wait to try some other things with this medium! Here are some more details on the fabric bag! I cut a piece of the graph paper to 5 x 8 1/2 inches, and used it as a pattern to cut the fabric piece. Also, the bottom edge is on a fold, so it doesn't have to be stitched. Before stitching up the bag, I cut two 1/2 by 5 inch strips of the red More Amore Designer Fabric, and stitched them to the outside of the bag about 3" down from the top. I also folded down the top edge towards the inside, and stitched it. And, to finish it up, I stitched the left and right sides of the bag with the right sides pinned together. I ran two pieces of Baker's twine through the two openings at the top, one in each direction and tied the ends together. These can be used to cinch the bag shut. See...not too complicated at all! Well, that is all for today! I have a few more mini Valentine's cards that I made for a challenge over on the Moxie Fab World Blog, so I'll share those soon. And, I have lots of projects using the Sale-A-Bration sets left to share. Never a dull moment around here! Thanks for stopping by. Welcome back to my blog! I have a few Valentine cards to share today, and I'll share a few more tomorrow. I made a set of 4 cards, and a fabric bag to hold them. This would make a great gift for someone! Here are the four cards all in a row with envelopes stacked on top of the fabric bag. I used the More Amore Suite of products for these projects, along with a few other stamp sets and accessories.I had a stack of Note Card sized envelopes from digital cards that I had printed for Christmas. (I wrapped my digital cards with a vellum wrapper, making them too large to fit in the matching envelopes. But, that is a story for another day!) So, I decided to play around with this 3.5x5 note sized card for Valentine's. I have to say, I really like the change! Here is the first card. I made it with the Pool Party Core'dinations Card Stock. I also used the same card stock with the Honeycomb Textured Impressions Embossing Folder, and then sanded the raised edges to highlight the ligher color. Love that design! Next, I cut a square of the More Amore Designer Fabric and a square of the Big Shot Adhesive Sheets, and applied the fabric to one side of the adhesive sheet. Next, I applied the other side to a square of Very Vanilla card stock. Then, I die cut a tag shape from it with the Two Tags Bigz Die. I tied some Pool Party Baker's Twine through the hole and the slit that the die creates, and then attached it ot the card front with Stampin' Dimensionals. Love those things! For the focal point, I heat embossed the Hoop La La stamp set, first with Pool Party Stampin' Emboss Powder for the hoop and then with Cherry Cobbler Stampin' Emboss Powder for the heart and greeting. Then, I attached the hoop to the fabric tag also with Stampin' Dimensionals. Here is a closer view of the card front. Love these images heat embossed. They look raised like a real cross-stitch would! Here is my second card for today. This one was also made with the Pool Party Core'dinations Card Stock as the base. First, I dry embossed the cross-stitch border from the Needlepoint Border Textured Impressions Folders. I sanded it again to highlight the raised design. Next, I took one of the tickets from the Artisan Embellishments Kit, and cut a notch in the end so I could use it as a banner. Second, I took a square of the word fabric pattern from the More Amore Designer Fabric, applied it to a square of the Big Shot Adhesive Sheet and then cut a banner shape from it. Third, and this may be my favorite part of the card, I made my own "washi tape"! I was so excited to see the Creped Filter Paper in the Spring Catalog. I cut a square from the large sheet, applied it to the Big Shot Adhesive Sheets, stamped the chevron image from the Oh, Hello stamp set with Real Red ink and then die cut it with the banner die from the a Hearts a Flutter Framelits Dies. I'll be doing this more! Love how it turned out. Here is a close-up of the card front. To finish the card, I layered the 3 banners, and added one of the pretty laser cut hearts in Real Red from the More Amore Specialty Designer Series Paper. I then stamped the eyelet heart from Hearts a Flutter in Versamark on Real Red Card Stock, heat embossed it with White Stampin' Emboss Powder and die cut it with the matching die from the Hearts a Flutter Framelits Dies. It is attached to the top of the other heart with more Stampin' Dimensionals. Don't they make everything look better? I think so. Lastly for today, here is the gift bag to hold the card set. Tomorrow I will share the details of how to make this. It is really simple! Well, that is all for today. Please join me again tomorrow for the other two cards in this set and more details about making the fabric bag. Thanks for stopping by! Welcome back to my blog! I have a scrapbook page to share today. And, guess what...it is digital! That's right...pick your jaw up off the floor. I made an entire scrapbook page digitally. I am still learning about all the wonderful things that MDS 2 can do. So, I think it takes me at least as long to make a digitial page as a paper one. Well, maybe since this one has 10 different pictures, that isn't true. Anyway, we received the More Amore Ensemble and Designer Series Paper in digital form also. I used some elements and papers from that pack. Well, that is all for today. I am keeping it short and sweet! See the supply list below. Come back tomorrow for another Artisan project. After that, I will resume with more Sale-A-Bration samples. Thanks for stopping by! Welcome back to my blog! Are you staying warm? It is cold, cold, cold here in my town! This morning it was -2 degrees, with about -20 degrees wind chill. Needless to say my dog and I went for much shorter walks today than normal! It's time to focus on some cute projects using some great products to celebrate love from Stampin' Up. That will warm us up, right? I have two cards to share today. The first was inspired by a sketch from the Freshly Made Sketches blog. I missed posting it in time for the contest, but I still enjoyed designing with the sketch. And, here is the card I made. I started by using the Fashionable Hearts Embosslits Die on the three colors of Core'dinations Card Stock from the Spring Mini: Pool Party, Primrose Petals and Real Red. Then, I sanded the paper to let the embossed designs show through. I put all of these hearts in a vellum pocket (just two pieces of 3"x4" vellum stitched together on 3 sides at first, and then stitched the fourth side shut. I added some white baker's twine which I tied some thin strips of the More Amore Designer Fabric to, and then attached it to the card front with some of the Designer Series Paper adhered to the front. Then, I stamped the Happy Valentine's Day stamp in Real Red first, then repeatedly in Basic Grey on a strip of Very Vanilla. I applied the red heart pattern from the More Amore Designer Fabric to a sheet of Big Shot Multipurpose Adhesive. I trimmed the strip and a notched end, and then applied it to the card. Then, I adhered the greeting with Stampin' Dimensionals. I finished the card with some of the Pool Party buttons, one of the freebies you can get with a $50 order during Sale-A-Bration! They have twine tied in them and are adhered with glue dots. Here is my second project for today, another love or Valentines card, but one that isn't too "foofy"! This might be a good card to give the man in your life. My card base is made from the Pool Party Core'dinations card stock. I stitched a rectanglle of Vellum Card Stock to the front of the card on my sewing machine. I stamped several of the hearts from the Hearts Aflutter stamp set onto Vellum Cardstock and stacked with them hearts diecut from the More Amore Designer Series paper. Then, I stitched down the columns through two hearts in a row. Here is a close-up of the stacked hearts. Cute, eh? Well, that is all for today. See the supply list below. Thanks for stopping by! Come back tomorrow for another Artisan project. Good morning, and welcome back to my blog. When I received all of these lovely Valentine's supplies from Stampin' Up, I decided to work on some online challenges. There are quite a few of them going on right now at the Moxie Fab World. This card is for the Use 10 Embellishments Challenge. I used 3 tickets and the vanilla rose button from the Artisan Embellishments Kit, 4 pearls, Pool Party Seam Binding Ribbon and Pool Party Baker's Twine...that make's 10! I also used the Primrose Petals Core'dinations Card Stock, and pierced the Very Vanilla layer under the heart. Speaking of the heart, I love that zigzag pattern from the More Amore Designer Series Paper! Here is a closer view of some of the embellishments! Welcome back to my blog! Today, I have another sample using the Vintage Verses set from Sale-A-Bration, which starts on January 22nd...just days away! I started by coloring the greeting with Island Indigo, Summer Starfruit and Tangerine Tango markers, die-cutting it with the Labels Collection Framelits Dies and sponging the edge with Island Indigo ink. I added two of the patterns from the Sycamore Street Designer Series Paper, and also a pattern from the 2012-2014 Designer Series Paper Patterns Stack in the Summer Starfruit color. Some of the Summer Starfruit Stitched Satin Ribbon was all it needed to be complete! Well, that's all for today. This week I have more projects to share, including my January Artisan Design Team projects. Thanks for stopping by! Welcome back to my blog. Today I am sharing a 3D project using the Vintage Verses stamp set from the upcoming Sale-A-Bration event, and also the Sycamore Street Designer Series Paper. Both of these items were both featured yesterday too! I created a little purse type of bag. The top flap has tabs that tuck into the folds on the sides to keep the flap closed. I started by coloring the greeting with our Stampin' Write Markers in the matching colors to the patterned paper (left to right): Rich Razzleberry, Tangerine Tango, Summer Starfruit, Pool Party and Island Indigo. Then, I die cut the greeting with the Apothecary Accents Framelits Dies, and also pierced around the inside of the frame with the Essentials Paper-Piercing Pack. I added some Rich Razzleberry brads from the Brights Collection Brads. I also dry embossed the vine image on Rich Razzleberry card stock using the Vine Street Textured Impressions Embossing Folder, which is another item from the Sale-A-Bration promotion that can be earned for free with a $50 purchase. You could also add some Rich Razzleberry 1/4" Stitched Grosgrain ribbon to the sides, and it would be a cute little purse for a gift card, or some small treat. That is my added tip for today! I hope you'll join me again tomorrow for another card using the Vintage Verses set. Thanks for stopping by! Welcome back! Today, I'm sharing more samples that I made for Stampin' Up's Leadership Event this past week. Making all of these samples kept me very busy during the month of November! But what a fun kind of busy it was. Sometimes I think I am more creative when there aren't so many decisions to make about what supplies to use. So, starting with a specific stamp set as the focal point, and a specific set of colors I was able to push my creativity out of the box. This is one of my favorite cards that I made. This turned into my favorite color combo too: Rich Razzleberry, Summer Starfruit and Pool Party with neutrals of Whisper White and Sahara Sand. Love it! Plus, I love the Pool Party Seam Binding Ribbon, the Elegant Butterfly Punch and some In Color Dahlias. I need to make a few of these up! I also used the Apothecary Accents Framelits Dies, and trimmed off the bottom edge making it straight just under the sentiment. Right after I adhered everything down, I remembered the Essentials Paper-Piecing Pack and wished that I had pierced around the inside of the white piece. So, that is my extra tip for you to try! The card uses the Vintage Verses set for the greeting which is a Sale-A-Bration set. You can earn it for free with a $50 order! The Sycamore Street Designer Series Paper is another item that can be earned for free with a $50 purchase. So, if you purchase the rest of the supplies (see the list below) including the paper piercing items you can get both the Designer Paper and the stamp set for free...that's awesome! Sale-A-Bration starts January 22, and runs through March 22. Well, I hope you enjoyed this project. Stay tuned for more Sale-A-Bration samples in upcoming days! Thanks for stopping by. Welcome back to my blog! 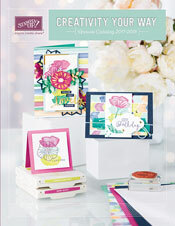 Today, I have another card to share with the Oh, Hello set from the current Spring Catalog. I really love this set. I was so happy to get it as part of my project to make samples for the Stampin' Up Leadership 2013 event. It was actually a fun challenge to make several projects from each stamp set, and even focussing on certain paper and embellishments. We didn't have the beautiful Tea for Two paper to use, but I chose to use the same or similar colors for my projects. For this card, I started with a Crumb Cake card base, and stamped the greeting with Early Espresso ink. Then, on Whisper White cardstock I stamped and repeated the patterned chevron image that had been colored with different markers: Calypso Coral, Island Indigo, Lucky Limeade, Pretty in Pink and So Saffron. Then, I stamped the outline image over them in Early Espresso ink. I trimmed this piece, mounted it to the card, and then tied some of the lovely Calypso Coral Ruffled Ribbon through a Pretty in Pink Designer button, which is adhered to the strip with a glue dot. I think I almost came up with a Clean and Simple card design! Well, that is all for now. Please join me again tomorrow for another project using the Oh, Hello stamp set. FYI...you can also get this stamp set in a bundle with the new Ovals Collection Framelits dies. After that, I will have some Sale-A-Bration samples to share, my 2012 Christmas cards and more of my December Daily pages to show. So glad that I can share all of my recent crafty projects here now! Thanks for stopping by.